Sunday 31st March marked the opening qualifier event of the 2019 Maver Mega Match This campaign. A sell out field saw one hundred and ten (110) anglers attend the ever-popular Midlands bagging mecca that is The Glebe for their chance to be first through to UK match angling’s richest final. Conditions for this opening qualifier were not ideal with a drastic change in the weather come the day of the match. After basking in warm air and bright sunshine on Saturday anglers were greeted with a bitterly cold north easterly wind and temperatures that felt no higher than just a few degrees. Many thought the match would be a hard affair, which it was for some, but despite the condition’s weights were respectable. First to make his way through to the 2019 Match This Grand Final was local Engineering Manager Alan Robertshaw (Leicester Gas A/C) from Leicester. Drawn on noted peg 1, Pool 1 and with the wind blowing into his corner peg, he opted to fish a simple match on the pole at just six metres down his left hand edge for the duration of the match. 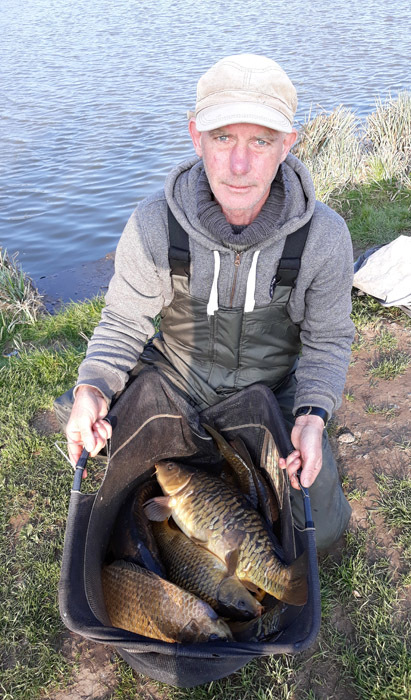 Despite the fish backing off at numerous stages during the day, Alan waited until they moved back in instead of chasing them out to catch steadily throughout. Feeding chopped worm with worm hook bait, Alan found fish to 10lbs for a winning weight of 137lbs 3ozs and books his place in this year’s Maver British Pole Championship final to boot. Second place on the day was Preston based angler, Michael Reed (Garbolino Exton), who drew Pool 7, peg 103. Making the most of limited protection from the elements, Michael opted to fish the pole at 12 metres feeding 6mm pellets with 6mm banded hard pellet on the hook to weigh in a final total of 120lbs 7ozs with fish up to 11lb. Michael also books his place in the British Pole Championship final. Third place went to Rob Brennan (Garbolino) who drew end peg 120 on Pool 9 to finish with 118lbs 13ozs. Rob had a slower start to the match than he would’ve liked with both his feeder and short lines failing to produce. A look down his edge, however, produced a number of small carp falling to maggot for a place in the British Pole Championship final.